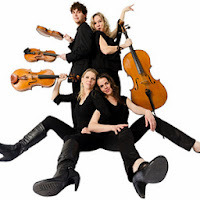 Frisco Kids: Coming Up: San Francisco Chamber Orchestra Free Family Concert - with Squid Inc.
Coming Up: San Francisco Chamber Orchestra Free Family Concert - with Squid Inc. This weekend, March 29-30, the San Francisco Chamber Orchestra is offering free family-friendly concerts for its Family Concert series, in San Francisco, San Mateo and Oakland. The concerts last 45 minutes. This one is a string quartet - rock 'n roll meets classical, with the Squid Inc. ensemble. Their original tunes and arrangements include numbers from Lady Gaga and Britney Spears, with Beethoven and Mozart.